WESTFIELD, Massachusetts – April 12, 2018 – Chambered for the straight-walled 450 Bushmaster cartridge, the new Savage 110 Wolverine offers both precision and power for deer, bears and hogs. Shipments of these firearms are currently being delivered to dealers. The 110 Wolverine’s AccuFit system lets you easily tailor the length-of-pull and comb height for a perfect fit, while its user-adjustable AccuTrigger offers a crisp, clean pull. 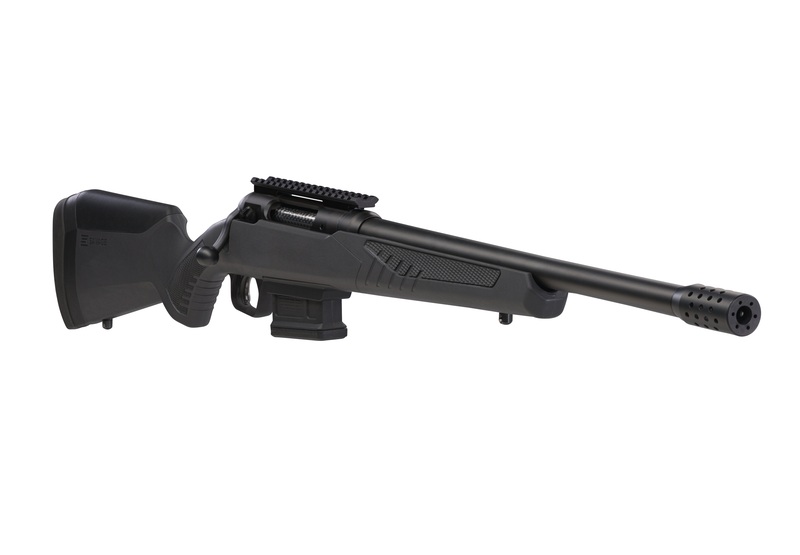 Together with the AccuStock, which secures the action three-dimensionally along its entire length, the rifle provides custom fit and function—right out of the box. Other key features of the 110 Wolverine include a Magpul AICS magazine and 18-inch carbon steel heavy barrel complete with a ported muzzle brake and 11/16-24 threading. Plus, a one-piece rail mounted on the receiver makes it easy to set up the rifle to your personal hunting needs. Savage is a brand of Vista Outdoor Inc., an outdoor sports and recreation company. To learn more about Savage, visit www.savagearms.com. This entry was posted in Weapon systems and tagged 110 Wolverine, 450 Bushmaster, Savage Arms. Bookmark the permalink.